BY ATTENDING THIS EVENT YOU PERSONALLY AND VOLUNTARILY ASSUME THE FOLLOWING RISKS FOR YOURSELF AND ANY MINORS OR WARDS ACCOMPANYING YOU TO THIS EVENT OR ENTERING THIS EVENT ON A TICKET PURCHASED BY YOU ON THEIR BEHALF: risk of serious injury or death by attending this event, and risk of damage or destruction of personal property brought by you to the event (whether or not owned by you). Mutant vehicles, artworks, theme camps and performances are not owned or operated by AfrikaBurn and you therefore assume any and all risk of injury, death or loss associated with or arising from their operation or occurrence. YOU ACCORDINGLY ACKNOWLEDGE THAT AFRIKABURN ACCEPTS NO RESPONSIBILITY FOR DAMAGE TO YOUR PERSON OR YOUR PROPERTY HOWEVER CAUSED AND RELEASE AFRIKABURN FROM ANY CLAIM ARISING FROM THIS RISK. You are expected to insure all property brought by you to the event whether or not you own such property. If you need to be medically evacuated you will be expected to cover these costs and so you should ensure you have adequate medical insurance in place. You must bring enough food, water, shelter and first aid to survive for a week in a harsh environment. Commercial vending is prohibited, as are all weapons, firearms, fireworks, rockets and other explosives. You agree to read and abide by all the rules contained in the survival guide, as well as all valid instructions from all event staff, and to follow national and local laws. This is a LEAVE NO TRACE, pack it in, pack it out event. You are asked to contribute two hours of general clean up in addition to your own camp before departure. You understand and agree that this event is a private event on private property where your use or creation of any intellectual property is subject to the ownership use rights of AfrikaBurn, or other attendees, and that promotional or commercial use of images, audio or video taken at the event, including media of people, objects and artworks and their use in print or social media, is prohibited without the prior written consent of AfrikaBurn. You appoint AfrikaBurn as your representative to take actions necessary to protect your intellectual property or privacy rights, recognising that AfrikaBurn has no obligation to take any action whatsoever. All vehicles including trucks, trailer, caravans and RV’s entering and exiting AfrikaBurn are subject to search by the Gate staff. 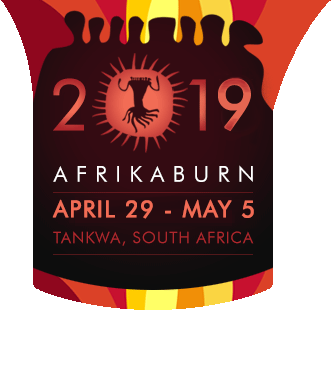 Tickets are non-refundable even if the event is terminated or cancelled due to harsh weather, acts of nature, governmental regulation or other conditions beyond AfrikaBurn’s control. This ticket is a revocable license that may be revoked by AfrikaBurn for any reason.